Gigantic flames reach into the sky." Fig.1. Hand coloured copper engraving of Iceland and some of its volcanoes, from the Physical Atlas by Heinrich Berghaus (1838-48). 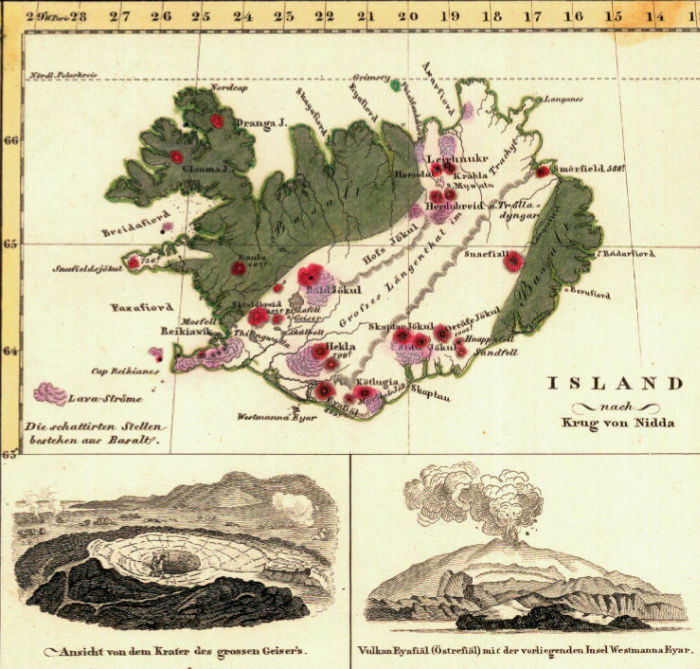 Volcanoes are nothing unusual on Iceland, but after three weeks of earthquakes on 8, June 1783 begun an eruption that is today considered the second largest in Iceland's historic records. In six months estimated 14 cubic kilometre of lava poured out from a total of 135 newly opened craters near the old crater of Laki (Lakagigar is a single mountain, Laki the chain of volcanoes), aligned along a more than 24 kilometre long rift southwest of the Vatnajökull. The lava inundated a lake and two rivers, vaporising all the water and flowing along the valleys in direction of the Atlantic Ocean. In the end the lava covered estimated 2.500 square kilometre of land. "First the earth swelled up with tremendous howling, then suddenly a cry that shattered it into pieces and exposed its guts, like a rabid animal tears apart it prey. From the smallest holes in the lava flames and fire erupted. Great blocks of rocks and pieces of grass were thrown high into the air in indescribable heights, from time to time strong thunders, flashes', rays of sand and light or dense smoke occurred... Earth trembled incessantly. …how terrible it was to see, such signs of an angry god...it was time to confess you to the lord." More than 9.000 people living in villages overrun by the lava and poisonous gases and ash rain were buried and burned alive or perished of asphyxiation. The ash poisoned the land and the sea of Iceland, killing half of the cattle's population, a quarter of the sheep's and horses, on the fields the crops died off and in the sea the fishes were killed - even in areas not directly hit by the eruption people begun to starve in the years 1783 to 1784. Twenty thousand people, one-third of the population of Iceland, were killed directly or indirectly by the eruptions of Laki. 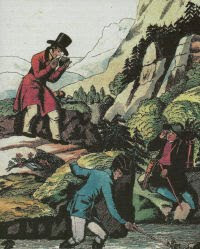 The ash blow up into the atmosphere influenced the climate of the northern hemisphere, and possibly by causing famine influenced even the history of Europe (the French Revolution in the years 1789-1799 was also triggered by high food prices). What happened to the information on the clouds of sulfuric acid that spewed from Laki?